Species of the genus Geranium L. (Geraniaceae, including ~300 species) are promising sources of polyphenols [1, 2, 3]. Uzbekistan is home to 13 geranium species [4, 5] that are used in folk medicine as astringent, disinfectant, hemostatic, and anti-inflammatory agents and to treat malignant tumors, diarrhea, dysentery, colic, insomnia, epilepsy, fever, rheumatism, and other diseases . 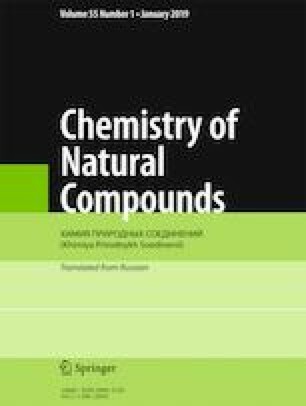 Phenolic compounds from geraniums (flavonoids including proanthocyanidins and others) possess broad spectra of biological activity such as antiviral, antimicrobial, hypoglycemic, antidiarrheal, antioxidant, diuretic, antiprotozoal, and anti-inflammatory activity [7, 8, 9, 10, 11, 12, 13, 14]. Translated from Khimiya Prirodnykh Soedinenii, No. 2, March–April, 2019, pp. 295–296. The work was financially supported by the Basic Research Programs, AS, RUz (Grants TA-FA-F7-008, VA-FA-F-6-010, and FA-F6-T198).